Northwest Paragliding Club Blog: Paragliding makes an appearance in new sci-fi book from one of our own! Paragliding makes an appearance in new sci-fi book from one of our own! It has been a few years since I flew with Northwest Paragliding Club and I have since moved down the trail of life. But my time soaring sites throughout the Northwest with you marked me well. Recently, the direction my career path is headed, changed. I've metamorphosed from just- another-engineer making a living working for a large software company to a creative, writing stories for a living. I've finished my first book, a science fiction novelette, and I wanted to share it with you. 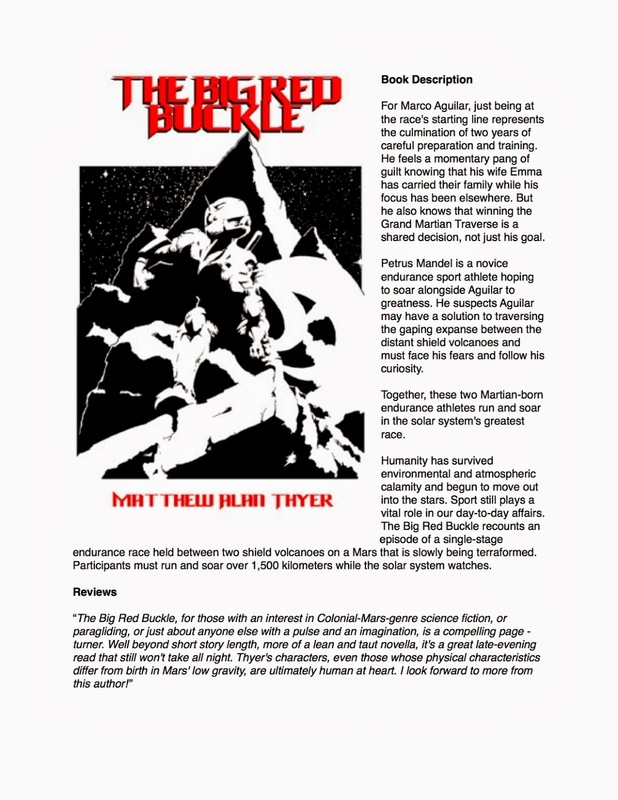 "The Big Red Buckle” (http://www.amazon.com/dp/B00HC5JWH8) is a tale about a single stage race in which competitors soar and run between two Martian shield volcanos. This book is the first in a series of stories I am calling "Sports in Space", but of all these planned stories, its focus is on a sport that we all love. I hope you enjoy reading "The Big Red Buckle" as much as I appreciated recalling memories of soaring around Tiger while writing it.